F1442 and F1445 BetterPosture Solace Plus Kneeling Chair by Jobri - Jobri Back Care Ergonomic Products - BetterBack, BetterNeck, BetterRest, BetterPosture, Nubax Tri and Theracane. This is the most popular model kneeling chair with a stronger steel frame at a great price. Made of polyurethane foam, metal Frame with fabric covering and nylon casters. Gas height adjustment. Overall width:27" (Star Base). Height range:22" to 27" Seat Size:16.5" x 14.5". Knee cushion Size:16.5" x 9.5" contour molded foam. 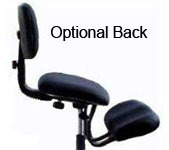 Optional Back (F1448/BK) available. 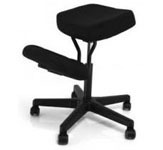 Optional F1448 Black Back Rest for the Solace Kneeling Chairs.